**I am no longer on the mainland, and I will be writing the remainder of this series from HQ (BoxJelly, I’ve missed you!). Things don’t always go to plan. This series is case and point for me. Plan: hit as many DMV spaces as possible. Execution: “as many as possible” means two spaces. Both spaces I ended up at were actually Unsectord events, so taking the perspective as an actual space user (as opposed to just a “tourist”) was a nice change. The first Unsectored event was a discussion on cross-sector leadership at Affinity Lab. With the cross-pollination and networking that occurs, there couldn’t have been a better setting than a coworking space for the discussion. At Affinity Lab, there was a key coded door, wide open receiving room, and a whole back area I knew I wouldn’t have time to schedule a tour for. Because of the limited accessibility I would have, I started paying closer attention to the details. It was at this space where it occurred to me how advantageous displaying member profiles could be. Upon entering, a table of business cards greet you. Towards the back by the printers is a bulletin board of one-page, self-authored profiles of members. Each personality comes through in their writing styles and flyer designs, and so did information on their businesses, skill sets, and experiences. What better use of copy/printing wait time, than getting to know your coworkers? The event itself left me with a huge sense of encouragement. I’m very fortunate to be recently graduated during a time where the base for this ecosystem for innovation is already built. The model for Unsectord events wouldn’t be as feasible without coworking spaces, and coworking spaces wouldn’t have been supported without the rise of the independent worker (whether you’re on the freelancing tech side of life, or the Downturn hustler end of the spectrum). Through coworking spaces, we can expect to see much more variety in what organizations and businesses do, the type of interactions we’ll have, and ultimately, the capabilities we’ll be using to fulfill that human potential. The Unsectord event we attended at Punch Rock was for a happy hour around social innovation. It was here that I met founder Roxie Alsruhe. PunchRock sits atop the third floor of a historic brick building, the first two floors of which are (also) an interior furnishing store. That also came with unexpected challenges – like people not taking them seriously. “We were the first coworking space in the nation’s capital that was focused on social impact. Many were skeptical of the idea, and [the focus] on social enterprises.” So PunchRock has become not only a coworking space, but also a learning environment and gathering place where different workshops like obtaining free legal advice from Georgetown Law’s Social Enterprise and Non-Profit Law Clinic are held and events like Unsectord discussions take place. From energy to education to genocide prevention, PunchRock members are cross-pollinating ideas, skills, and networks. Sitting next to us was Dewey, an intern with Three Birds Sustainability, an organization that brings renewable energy to underserved schools and integrates renewable energy into their curriculum. A couple desks away was Hyungsoo, who designed a timepiece, the Kickstarter for which was launching the next day (and has raised over $500,000 in just 35 days). A faceless watch (or, timepieces because you don’t actually ‘watch’ it) – is innovative, creative, and about every other buzz word you could think of, but it’s the impact it has that matters (especially for the blind, and visually impaired). “…there’s something much bigger than you are,” Roxie explains. “A lot of different issues need to be confronted with, and imbedding that into your lifestyle and with the work that you do.” As we would say at the BoxJelly, Work the Way You Live! From our first day: touring the campus. So this is it; the reason I’m TRIPPIN’. I approached The Social Innovation Program with the question: “How am I going to learn more about social innovation?” The answer: by doing it. The first week was packed with speakers that presented on everything from accounting to the “myths of social entrepreneurship“. Then for the following four weeks, we broke out into teams and performed consulting projects and created our own lean-startup models. Our team consulted for a performing arts organization and a service center, and attempted to address the gap in technology education for undeserved communities. Other consultation projects included work with organizations from farmers’ markets to community discussion platforms, and lean startups that addressed issues of ex-offender re-entry and social innovation education at the elementary school level. What a trip! Co-living and co-working is a large part of how we were able to deliver so effectively in such a short period of time. We’re seeing this paradigm shift of the way we work, which also includes shifts in the way we live. InterGen Care at Graduation/Pitch Fest! By living this way for the 5 weeks of the program, I was confronted by my expectations, and the unexpected. Expectation: I won’t use Twitter until more of my friends do. The Unexpected: I’ll make new friends that will prompt me to up my Twitter game, and I’ll realize how much professional potential there is to unlock (thanks Ramzy!). Expectation: I’ll get to know my roommates, and we’ll learn to live with each other. The Unexpected: My roommates will get to know me, and we’ll have to learn how to live without each other. As a graduate with no “real job”, it was discouraging trying to find opportunity. Having all securities such as prospects, predictability, and instantaneity fall from under you is admittedly scary. But the thrill teaches you, and in the clarity of zero gravity, I have come to what so many others realize: opportunity is created. Expectation: The world is a big place. The Unexpected: The world is infinite. The Center was donated by Jo Ann Flubaucher Withrow ’63 in honor of her late husband Ward Withrow ’60. Being so close to my alma mater and hometown-away-from-home, I had to visit good ‘ole Hanover and Madison, Indiana. I’m glad I did because Hanover College has coincidentally implemented the perfect coworking environment. Admittedly, I was rejected for a grant to study the application of coworking in the design of public campus spaces at HC, but so was Frank Lloyd Wright’s architectural proposal, so I digress. This used to be a laundry room. Our Sociological Research Methods class (led by Dr. Robyn Ryle) formulated recommendations for renovation implementations. “Back in my day”, (as in 2012) Phase I of the “SAC” (as we endearingly called it), had a few pool tables, some flat screens, a few ping pong tables, and a ‘theater’ (bunch of sofas in front of a huge flatscreen). With the completion of Phase 2, there is now a computer lab, a stage with a green room, open area space where pool tables and ping pong tables, meeting rooms, common areas, lunch nooks, and organizations such as the Haq Center lining the first and second floors (yes, BOTH floors are now in use!) which include the student life offices. This used to be underutilized storage area. There are now countless possibilities for interaction with all of the diversity in space – student organizational meetings, class project work sessions, networking over ping-pong – the list is endless! A lot of conversation could occur between coworking spaces and institutions with spaces such as the SAC. I am jealous of, but more so very excited for, all future Hanoverians. NOTE TO STUDENTS: Take advantage that costs such as ‘membership dues’ are already factored into your tuition, and quarters aren’t required to operate the pool tables (billiards skills are ESSENTIAL to connect with local sub-cultures of the nearby town of Madison, IN). NOTE TO ’12 CLASSMATES: If you need to find me during Homecoming, I’ll be on the beer tour at The Shoebox, or hustling pool tables in the SAC. In front of the Lanier Mansion. I don’t have much to say (there are no coworking spaces here), except for my expressions of affinity for this little river town. It’s got so much heart and soul if you look, and it unfortunately took me 4 years to find it. It’s a small town, but there are a lot of professionals that are either located here or pass through because of behemoths like the power-plant, that would/could use coworking; not to mention the population of tourists, and community opportunities that coworking spaces tend to bring. The question of coworking in rural areas always tugs at my interests because of Madison being my home-away-from-hometown. If you’re interested in this conversation too, please, get @ me. iHub is a coworking space within Nucleus (a research park), located in downtown Louisville. For just $80/month, membership grants you access to the entire space (which includes mailing services, meeting rooms, and events), free coffee, and free parking. My host, Vik (director of iHub), was inspired by the cross-pollination and networking aspects of coworking, and in six months time, turned around what used to be a storage building for Nucleus into a coworking space. For Nucleus, it’s a great way for vertical industry cross-pollination, and can act as a sort of feeder into their main facilities, which include office spaces, laboratories for research, and business management and consulting services. They are very open to first-time users, offering free use of the space to them. Vik emphasized not having to monetize services, by having the right alignment in order to be a magnet for those who will best carry out the initiatives you are trying to implement. In the same way that word-of-mouth is the most effective form of marketing, alignment is the most effective way for a coworking space to exist. “It’s all about identifying the needs for the ecosystem,” said Vik. “Louisville is extremely strong in the manufacturing, distribution, and long-term healthcare sectors. How do we cross-pollinate and innovate around them?” In answering this question, iHub creates a sort of ‘critical mass’, a density if you will, for creativity and innovation, that it will eventually feed into the science park and in turn, serve as a beneficial ‘Nucleus’ (puns intended!) for the entire city. The launch of XLerateHealth’s Accelerate SMARTCAP Program at iHub could not have been an anymore serendipitous example. Vik extended an invitation for me, as it was scheduled during our time to meet. Louisville Mayor Greg Fischer was in attendance, as well as Ted Smith, the chief of economic growth and innovation. An initiative of the National Space Biomedical Research Institute (NSBRI), the SMARTCAP program will be an accelerator program, with awards in $20,000 to each selected participating early-stage startup companies who address healthcare barriers in space to address problems here on earth, such as access to remote areas, limited resources, and patient evaluation. (Space flight will also turn commercial within our lifetimes, so look out for that as well.) Selected start-ups will also have full access to Nucleus services, and of course, access to a network which includes NASA. They are currently accepting applications. Louisville is a prime location for this program to emerge, not only because of Nucleus, but also because of the city’s rich history in distribution and healthcare. With all of this wonderful news, I couldn’t help but wonder how all of this benefit would include/enhance the lives of the people living in Louisville, and in Kentucky. The answer? Organic growth (of the economy), of course. The next “space” that I would visit has not yet opened it’s doors, but founder of what will be Method in Louisville, Christopher Davis, was more than willing to meet with me. We met of course, at the place that parented the whole coworking concept: a coffee shop. Quills Coffee on Baxter Ave. 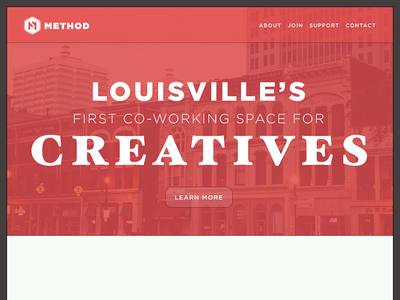 The more he looked around, the more Chris realized that Louisville needed a physical space for a designer and developer culture to form (much like what Nucleus is doing for the entrepreneurial, science, and healthcare culture); for people to come, create, build, and ‘”organically” develop the identity of the designer and developer cultures that are not yet in place. Realizing that renting desks would not feasibly sustain a space and distracts from other financial opportunities, Chris wants to build Method with the intentions of it being a creative commons; a place to cultivate creativity in Louisville. “The more I explore it, the more I realize that what we don’t have is a space that’s constantly trying to benefit and grow the creative economy in Louisville. that’s what I want to do in this space.” His ideas build a sort of support matrix that would patch a lot of holes that many urban areas see (such as unemployment, lack of educational opportunities, and outsourcing). Workshops and events open to the public, a three-tiered educational plan, and a “Startup Weekend” type of event to act as a crowd-sourcing program to address the city’s problems. Chris is one of those people whose emanating love for their city keeps its heart pumping. Literally, a place would only be a bunch of buildings if it weren’t for the initiative of its citizens to contribute to its life flow. As a millennial, it can be overwhelming to figure out where to start as our generation ages into the professional world and leadership positions, but there are great examples of peers we can look to for that glimpse of guidance. Next: How Hanover College is (coincidentally) creating a coworking environment.